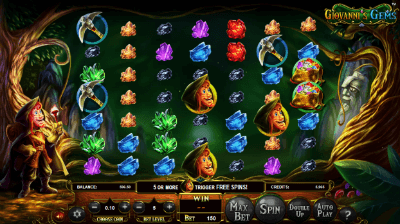 The developer of 3D video slots Betsoft Gaming announced the release of a new slot machine called Giovanni's Gems. The plot of the game is based on the film "The Island of Giovanni." Developer Betsoft Gaming once again managed to surprise fans of slot machines with the novelty of Giovanni's Gems with unusual mechanics. The colorful 7x7 slot does not have traditional betting lines, and all wins are formed using the Clusters Wins function. Players are waiting for adventure in the search for treasure along with the protagonist Giovanni, free spins, interesting properties of a number of characters and significant winnings. Among the unique features, there is the allocation of payments for cluster wins.This means that if you collect a combination of five identical icons, it explodes on the playing field, and the new icons fall from the top, occupying the free cells. This allows the gambler to get larger gains than the standard charges. Winning combinations are formed from identical symbols standing side by side at a right angle along the vertical and horizontal lines. There must be at least five same images. After calculating the payout, the symbols involved in the combination explode. The explosion of images causes a chain reaction in the nearby coals, which turn into diamonds and bring the corresponding payout rate, after which they also explode. The image above, which forms new coincidences, falls on the vacant space. The Clusters Wins function is disabled when there are no matches, after which the next spin starts. Any winning you receive can be increased by playing equal chances "Red/Black". The base symbols are multicolored gems, a pickax, a bag of gems, a torch and an inconspicuous coal, hiding something from the eyes of the treasure hunters. The image with unique properties – the portrait of Giovanni – is endowed with the function Scatter. The scatter symbol can bring payouts (from three images anywhere on the screen) as well as free spins when certain conditions are met. From 5 to 25+ portraits of Giovanni on the playing field can bring from 7 to 50 free spins. The more images of the adventurer there is, the more free spins you get. Giovanni's Gems slot machine is a colorful design, unusual features, not boring gameplay, which brings serious prizes. Slots will be appreciated by high rollers and everyone who likes games with original mechanics. You can try the novelty for real money or have fun in a free mode.